1. Acute Panretinal Structural and Functional Abnormalities After Intravitreous Ocriplasmin Injection — JAMA Ophthalmol. 2014;132(4):484-486. Conclusion: Retinal dysfunction associated with intravitreous ocriplasmin injection is not limited to the macular region and seems to involve the entire retina. Enzymatic cleavage of intraretinal laminin is a biologically plausible mechanism for acute ocriplasmin retinal toxic effects. 2. 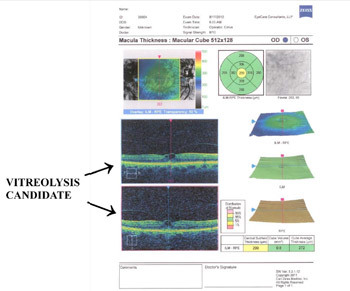 Vision Loss After Intravitreal Ocriplasmin: Correlation of Spectral-Domain Optical Coherence Tomography and Electroretinography — JAMA Ophthalmol. 2014;132(4):487-490. Conclusion: On the basis of these findings, it is possible that ocriplasmin may have a diffuse enzymatic effect on photoreceptors or the retinal pigment epithelium that is not limited to areas of vitreomacular adhesion. The rod photoreceptors may be more susceptible than cone photoreceptors to the effects of ocriplasmin. Further work is needed to understand mechanisms of visual impairment after ocriplasmin.